MEATBALLZ. | Britt Does Fit. Okay everybody it’s time to get going with some meatballs. 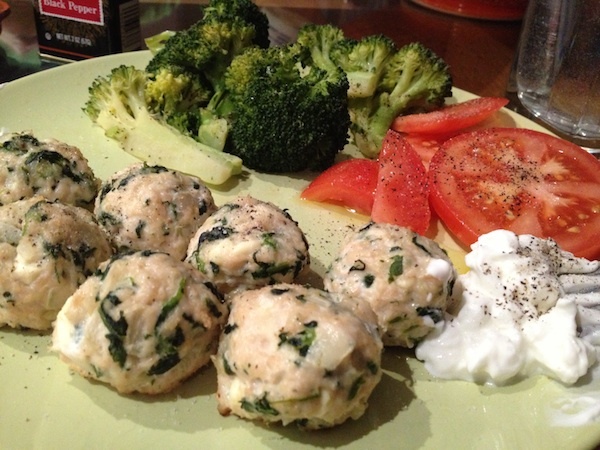 Regular meatballs are made with ground beef, which is not a great source of lean protein, as we all know. 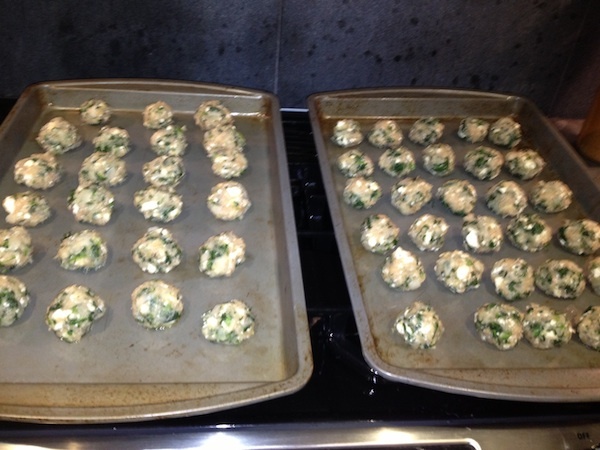 These meatballs are a recipe that my mother makes, that was passed down to her by Rachael Ray. We made some adjustments and now they are perfect fitnessing meatballs. SO HERE YOU GO. As happened with the chicken salad post, I doubled the recipe, and I’m actually going to post this as a double recipe, because you should make this much and then FREEZE HALF, and oh look now you have four servings in the freezer for when you get home late. You’re welcome. 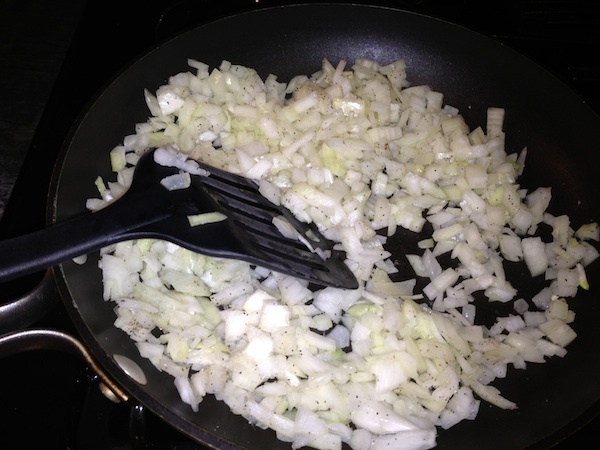 First you’ll want to cut and saute the onion, because if you put it into the meatball mix raw, it’s a little overpowering. LET’S JUST FIX THAT SHALL WE. Show those onions who’s boss. Now while you’re owning those onions, you’ll want to drain the chopped spinach (like, ALL the water, make tight fists and then tighter ones). 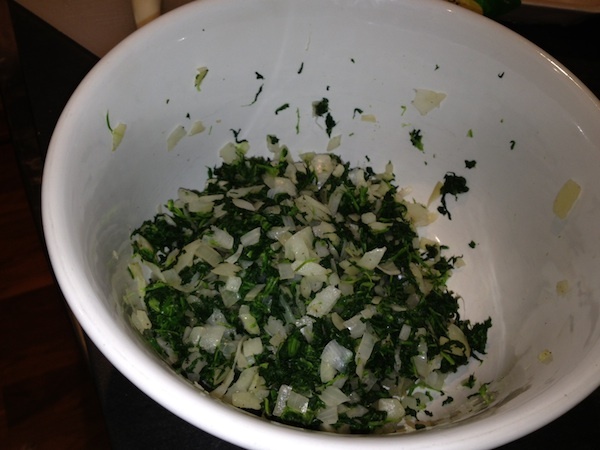 Add the spinach and onions to a mixing bowl and then grate (zest?) the garlic cloves so they mix in real well. 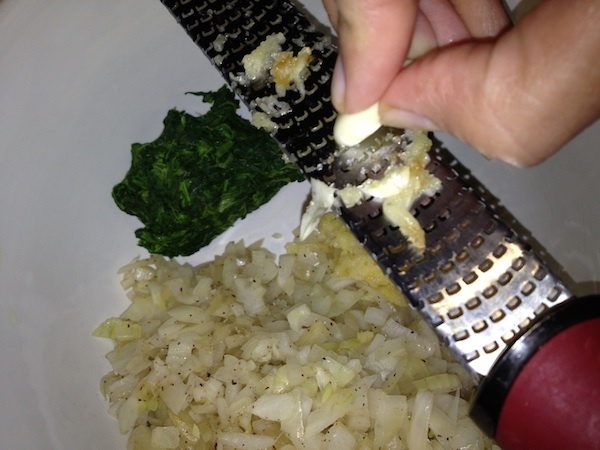 Now you have to get your hands gross, and separate the spinach while you mix it in with the garlic and onion. It takes a little time, when you’re done it will look like this. 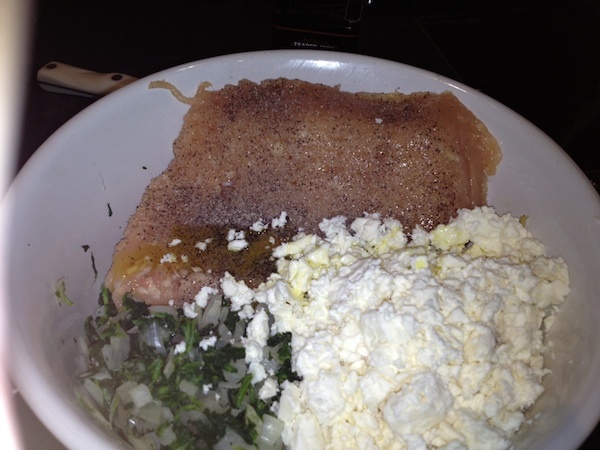 Now you can add the olive oil, crumbled feta, and ground chicken breast into the bowl as well. Throw a few pinches of salt and pepper on there too. Before you do the next step, go ahead and preheat your oven to 400 degrees, and prepare 2 baking sheets by spraying some Pam on them. And then this is the absolute worst. You have to get your hands even grosser, and just mix all this raw meat into the rest of this stuff. It will take a little time. It will be disgusting. But since you’re making a double batch, you won’t have to do it again anytime soon. Ugh. So gross. Anyway do it until it looks like this. You’re not out of the woods yet. Your hand will continue to touch the raw meatballs for another ten minutes or so, while you make the bowl of meat into a million meatballs. Grab a little bit with your hands (I like them small, so like a tablespoon or so) roll them for a second or two (not too long or they’ll get tough) and place them on a pan with nonstick spray. Now you have a million raw meatballs. Place the pans in your 400 degree oven for 10 minutes (maybe 12 of your balls are bigger). When they’re done, they’ll look like this! 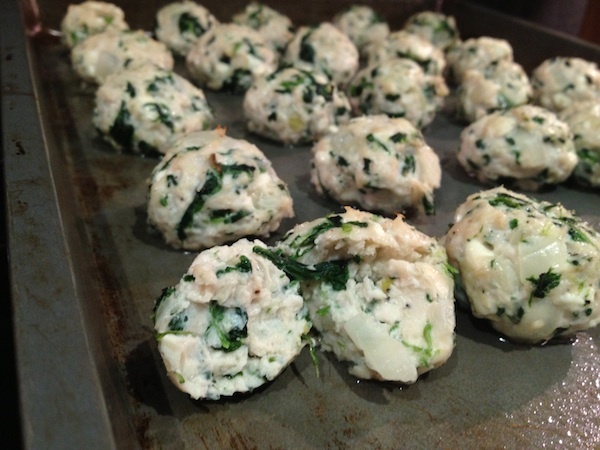 So depending on how hungry you are, whether you worked out that day, and how big the meatballs are, you’ll probably want 4-6 per serving (remember, you want about 3 – 4 oz of chicken). Like I said, one of the best things about making a huge batch of these is that you can freeze them and have them available for a quick healthy dinner, since you’ve got such a busy schedule. 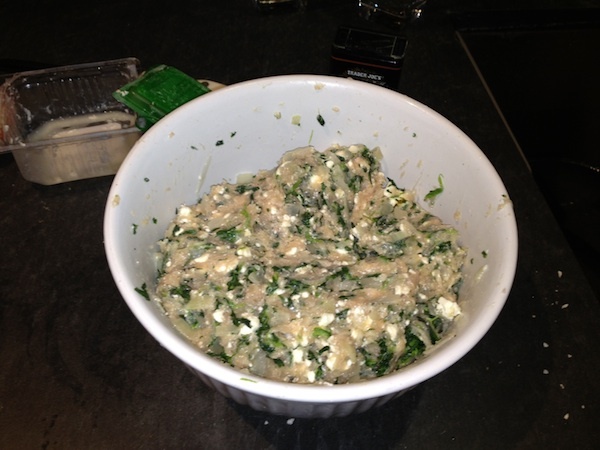 And since they’ve got the garlic and feta and spinach already in them, there’s already a ton of flavor, so you can throw them on a salad, have them in a pita with spinach and greek yogurt, or serve it like I did with a veggie and tomato and greek yogurt. 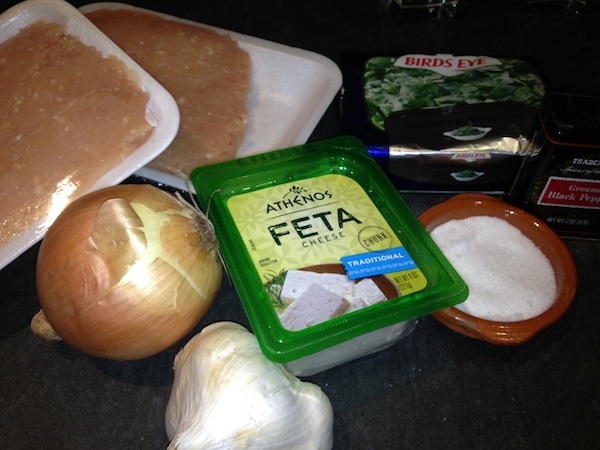 QUICK TIP: A lot of “tzatziki” out there is not actually made with greek yogurt as the main ingredient. It’s cheaper for companies to use sour cream instead, so even though it’s label “yogurt cucumber dip,” the main ingredient may be sour cream. Don’t buy that. They took the healthiest part out of it. If you can’t find it with only a few ingredients (greek yogurt, cucumber, garlic, lemon, basically) then skip it and just use plain greek yogurt. It’s still supagood.